UPDATE: Numbers are a bit smaller than expected, so in order to gauge interest and potentially send out more invoices I am updating the terms of the group buy. ALL FUTURE INVOICES CAN BE PAID UP UNTIL THE DEADLINE. So if you are interested or on the fence, you can submit the form and pay your invoice before the final deadline. 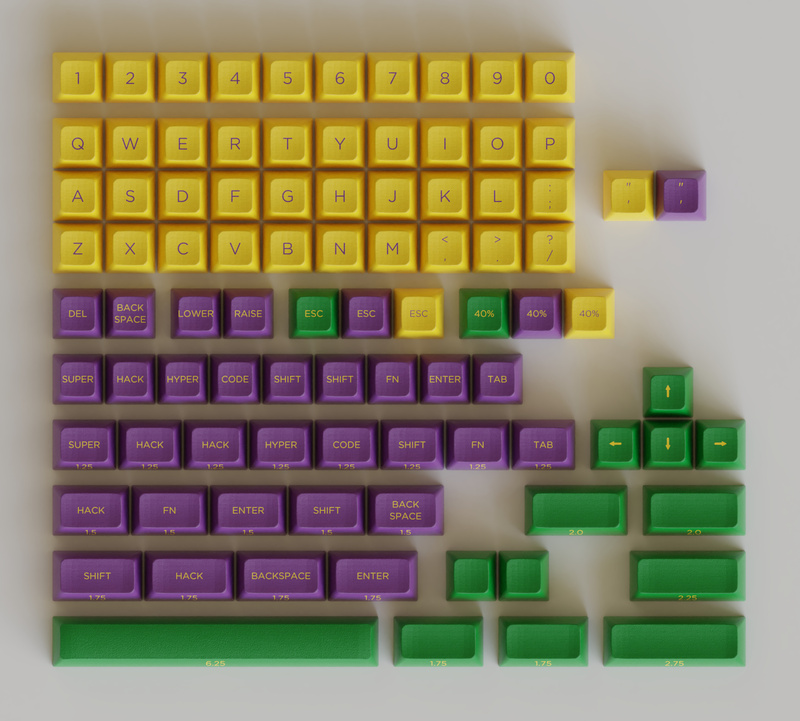 Today, 3/25/2019, marks the beginning of the DSA Mardi Gras 40% Keyset Group Buy. DSA Mardi Gras is a personal project of mine with the purpose of sharing the New Orleans tradition of Mardi Gras. Coming from the community of 40% keyboard users (40% Keyboard Discord https://discord.gg/HydeZT2 ), I have designed a keyset that is focused on providing coverage for major sub-60% keyboards such as the Prenonic, Planck, Minivan, JD40, JD45, Vortex Core, Pearl, THE50, Daisy, as well as others. The GB will run for 3 weeks (possibly 4 depending on momentum). Manufacturing lead time is estimated to take 10-12 weeks and shipping will commence once the keycaps are in my possesion. During the group buy, I will be sending out invoices. I ask that you pay them promptly during the GB phase. MoQ pricing tiers will not be considered reached unless invoices are actually paid. Once the group buy ends and all invoices are paid (or past due), I will send out partial refunds for the difference in pricing tiers. Payment will then be submitted to Signature Plastics and manufacturing will begin. I hope you guys like this set and show your support. The kit took a lot of thought on how to provide coverage for popular 40% keyboards, while keeping the number of keys and price down, as much as possible. It will also be a template for future 40% focused keysets. Thanks so much for taking a look!! DISCLAIMER: I currently work 12 hour shifts overnight and sleep during the day, in between my shifts. Luckily in my profession, I only work 3 nights per week. With that said, I will do my best to send out invoices as promptly as I am able to do. Most activity from me will be during the latter part of the week, so expect updates and invoices around then. In the meantime, if you need to reach me, you can drop a message here or on Discord and I will get back to you as soon as I am able. Thank you in advance for your understanding. in for 1. excited to see what this kit can do for the 40s community as we move forward! FYI, for everyone who has joined so far. I may be refunding everyone and re-invoicing using my personal PayPal account. The business account I created has most of the payments on hold until I ship the keys. This, of course, won’t work when I have to pay Signature Plastics. Apparently the business account is too new and doesn’t have the history needed to release funds immediately. Sorry for the inconvenience. I’ll probably be doing this over the next day or so. Good day, everyone. Just a quick update on numbers. I have a few commitments for multiple sets, so we are getting closer to hitting the 50 MoQ mark everyday. Ideally I would like us to at least get to the 75 MoQ hurdle, as the set drops in price by $10. We are about 10 days away from closing at the moment. Once again, I appreciate your support and am excited to get closer to having my creation become a reality. Hello everyone!! Just a reminder that this is the last several days of the group buy. So if you still want in, fill out the form. The last day to request an invoice is Monday, April 15, 2019. Thank you for everyone who has participated so far!! Let’s make this happen!! We are headed into the last weekend of the groub buy. If you haven’t already, head over to the form and show your support for the 40% community!! Let’s finish strong!! Good morning everyone. The group buy has been extended by a week until Monday April, 22, 2019 to give it a chance to reach higher MoQs. I’m sorry to report that the group buy has been cancelled. Even after I extended it by a week, there has been absolutely zero traction and no new orders were placed. We simply were not close enough to the first MoQ and my goal of getting at least to the second tier. For these reasons I have decided to “shelve” the project for now and re-approach it at a later time. Maybe the colors were just too bold for some…I just don’t know. Yet, I have had a great learning experience doing my first group buy and I have some future projects up my sleeves. This isn’t the last you’ll hear about this set…it will return one day in some form. Thank you for all the support and encouragement through this process. You guys are the best!